We meet today to officially establish ASTRA (Assoc. of Swedish Teachers & Researchers in America). In 2011, both SASS and the American-Scandinavian Foundation, the primary organizations to which we turn for intellectual and monetary support, will celebrate their centennials. Since the 1960s the Swedish government offices in the U.S. and the Swedish Institute in Stockholm, have also contributed significantly in advancing our cause, through workshops for Swedish teachers/researchers, support for travel and study abroad, lists of new texts and dictionaries, gifts of books and information materials, even monetary prizes for graduate students. A short history of these activities is submitted below as a guide to some of the efforts ASTRA may be considering. Swedish Information Service/Swedish Consulate General/western U.S. (Lars Malmström, Ulla Reilly, Karin Seeman, Elisabeth Kihlbom) sponsor ACADEMIC WORKSHOPS for Nordic Area Studies and Swedish language/literature/culture teachers at the consular offices in San Francisco, continuing in 1978 at the consular offices in Los Angeles, and at various universities (Texas 1978, Washington 1987, Pacific Lutheran 1989, UC/Berkeley 1990, UCLA 1991). 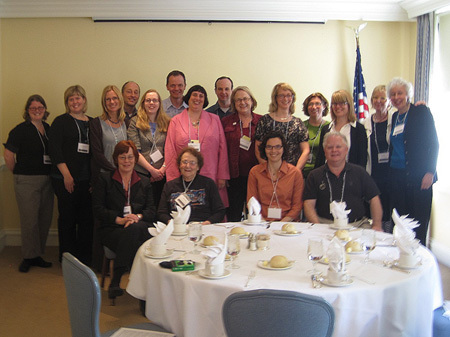 Swedish Information Service/midwest and eastern U.S. (SIS directors, Marna Feldt), with the Swedish Institute, sponsor ACADEMIC CONFERENCES for teachers of Swedish, in early years these included adult ed. teachers, in later years graduate students. These gatherings took place in the midwest in even years, in the eastern time zone in odd years. The first gathering in 1976 was at Wisconsin/Madison, the second in 1977 at the American-Scandinavian Foundation in New York. Swedish Information Service merges into the Swedish Consulate General in New York, and these conferences also merge into one gathering for all Swedish teachers in North America. The first such conference was held at Michigan/Ann Arbor. In 1996 Marna Feldt retired, her successor Dan Olson organized the 1996-98 conferences, then Alex Treitler from 1999- 2002, and Niklas Arnegren from 2002-2009. Last year's conference was held here at Washington/Seattle on Oct. 15-17. ASTRA expects to continue this venerable tradition, in cooperation with the Swedish Institute, at a conference in Washington, DC in mid-October 2010, hosted by the Swedish Embassy. The Aurora Borealis Prizes for the best papers delivered at each SASS conference by graduate students in good standing at North American universities, in Nordic area studies and in Nordic language- literature-culture, were established in 1985, originated by incoming SASS president Robert Kvavik. Funded annually by the Nordic government offices in the U.S., the first awards were made at the 1986 SASS conference at Luther College in Decorah, Iowa. The SASS President's Travel Grants for Graduate Students and Independent Scholars, established to partially cover travel to SASS conferences, are funded by donations from the members of SASS. These annual awards are divided among all applicants proportionally, based on support provided by the students' own academic institutions and the distance to the conference.